OSWEGO – Education at Leighton Elementary School has gone beyond core academic areas to include the importance of health and wellness. 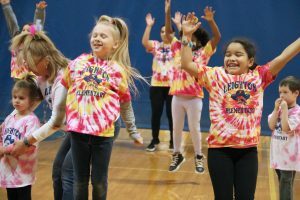 Leighton Elementary third grade and pre-kindergarten students enjoy a Zumba session during the school’s inaugural Wellness Day. The building recently hosted its inaugural Wellness Day where students were joined by their teachers in experiencing various physical fitness routines, mindfulness techniques and healthy eating choices. The event coincided with March as National Nutrition Month and it was the hope of physical education teacher Frederick Donabella that students would take information they learned home to lead healthier lives both inside and outside of school. A committee full of Leighton teachers worked together to attract local organizations to be a part of the fun. Students enjoyed Zumba sessions with Emily Nasal, of the SUNY Oswego Fitness Center; a collection of fitness games with representatives from the Oswego YMCA, Healthy Highway games, taekwondo moves under the guidance of Master Pryor’s Taekwondo America and breathing/mindfulness techniques. “Mindfulness calms down your body!” said Hunter Hutchins, fourth-grader. Jessica Leonard, fourth-grade teacher and committee member, said both she and the Leighton community were proud to see former Leighton student Andre Mendez attend Wellness Day to educate current students on how participating with the Oswego Boxing Club has helped him achieve success. Several students enjoyed punches and push-up techniques with him, another former Leighton student Martin Orta and OBC co-president Derrick Falcetti. Leonard said the Wellness Day meshed perfectly with the county-wide Healthy Highway initiative, which educates students on green (good), yellow (OK) and red (poor) food choices. Healthy decision-making is both a key component of that initiative, as well as what Leighton students are encouraged to embody each day.